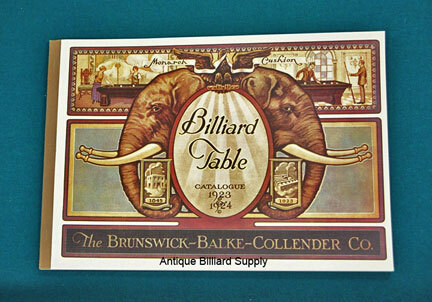 #12-02 Reprint of Brunswick-Balke-Collender catalog from 1923-1924. Out of print for years, this high-quality full-color reproduction of Brunswick's original catalog is an important piece of billiard history. It features many tables, including the Aviator, Wilmington, Madison, Regal, Regina, Rochester, Arcade and includes color photos and technical information about each table. It details the history of the company and gives information on how tables are constructed. It also shows the full line of billiard accessories, soda fountain equipment and tobacco cases available for sale at the time. Each of the 68 pages is about 13 inches wide, 9 inches tall. Protective dust cover included. $65.